This beautiful and clever book takes as its subject the construction of the Three Gorges Dam in China. 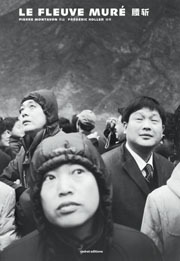 Swiss photographer, Pierre Montavon, photographed the affected provinces of Hubei and Chongquin, between 2003 and 2006. Le Fleuve Mure is eloquently presented in three sequences. The first chapter, photographed in black and white, shows parts of the construction of the dam. Abstract tragic landscapes and details cohabit here, depicting the enormous scale of the dam. The second part is on the human and social upheaval caused by the rise of water level. Numerous neighbourhoods were completely destroyed, forcing more than two million residents to migrate away from their roots and occupations. When the photographer turns to colour, in the final section, it automatically brings a more modern tone and shows a new side of China. It is dedicated to the country’s urban plans and on the relocation of the population affected by the dam. The sudden use of colour emphasises what has been lost on the way.